Kevin Le Blanc was the lone Irish singles winner as the Continent of Europe took a 8.5-3.5 lead against Great Britain and Ireland into the second day of the Jacques Leglise Trophy at Prince’s. The teenager from The Island beat Edgar Catherine of France by one hole but Co Louth's Thomas Mulligan and Kilkenny's Mark Power lost to Swedes, Mulligan by 6 and 5 to Marcus Svensson and Power by two holes to Pontus Nyholm. All three Irishmen lost in the foursomes, Mulligan and LeBlanc by 6 and 5 to Frenchmen Edgar and Adrien Pendaries and Power and Toby Briggs by one hole to Norway's Kristoffer Reitan and Spain's Alejandro Aguilera Martin. Playing in hot conditions on England’s south-east coast, the visitors were in impressive form with wins in three of the four morning foursomes, before picking up five successes in the afternoon singles. “I am very happy”, said The Continent of Europe’s non-playing captain Jeroen Stevens. “We got off to a fast start this morning winning 3½-½ and the boys played really well. In the afternoon, we came out of the singles with five points, which is good again. We thought we were going to have a bigger lead at one point, but that’s golf. “It was a very tough morning, a very poor performance, and it was only marginally better in the afternoon”, said GB&I non-playing captain Peter McEvoy. “You have to put in context though, The Continent of Europe team played very well and scored really well. There were birdies and eagles out there all over the place so sometimes you have to admit that the other team played superbly. "In saying that, I thought we were ordinary and we’re going to have to up our game tomorrow if we are going to pull a result off. Former Boys Amateur champion Svensson was the outstanding performer in the afternoon singles, comprehensively defeating Mulligan 6&5. Despite winning the third hole with a birdie, the Irishman lost five of the next six holes, leaving Svensson 4up at the turn. A birdie by the Swede on the 12th increased his lead further to five holes and the match came to a conclusion at the 13th following a bogey five from Mulligan. Denmark’s Johnathan Goth-Rasmussen was next to claim a point for The Continent of Europe, narrowly beating GB&I playing captain Marco Penge by one hole after the Englishman bogeyed the 18th. Adrien Pendaries was victorious over Jamie Stewart by two holes, the Scot conceding the final hole after losing his ball in the rough following a wayward tee shot, while his opponent’s ball sat well-placed in the middle of the fairway. Pontus Nyholm won by the same scoreline against Power, the Swede taking control of the match after winning two holes in a row on the 10th and 11th, before stretching his lead to three holes with a birdie on the 13th. Power responded by winning the 15th and 17th with birdies, but another dropped shot at the last by a home player put The Continent of Europe into a commanding 7½-½ lead. Nevertheless, Alex Fitzpatrick, brother of Europe’s Ryder Cup team member Matt, picked up GB&1’s first win of the day with a slender one hole success against reigning Boys Amateur Champion Falko Hanisch, which was quickly followed by Charlie Strickland’s 5&3 victory over Maximilian Schmitt. Former Junior Open Champion Matt LeBlanc’s match against Edgar Catherine went to the final hole, the Irishman sealing the outcome with a birdie. However, Kristoffer Reitan gave The Continent of Europe the final point of the afternoon with a two holes win over Toby Briggs. In the morning foursomes, the all-France pairing of Pendaries and Catherine took control of their match against LeBlanc and Mulligan from the outset and never relinquished the lead in a convincing 5&4 win over the Irish duo. GB&I managed to post their first half point on the scoreboard when Penge and Fitzpatrick halved their match with Svensson and Nyholm, but Schmitt and Hanisch hit back to claim another point for The Continent of Europe, defeating Harry Goddard and Strickland 3&2. The match featuring Power and Briggs against Reitan and Alejandro Aguilera Martin went the distance, with The Continent of Europe picking up another point to conclude an excellent morning for the visitors. For live scoring, results and all the latest news visit our Championships site. 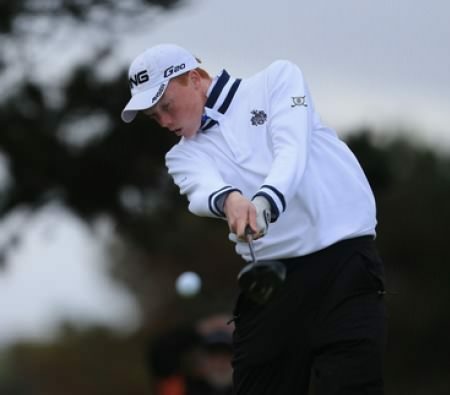 County Louth's Thomas Mulligan won his foursomes with Marco Penge and halved his singles as Great Britain and Ireland overcame a two-point deficit to tie 12½ -12½ with the Continent of Europe and retain the Jacques Leglise Trophy at Royal Dornoch.